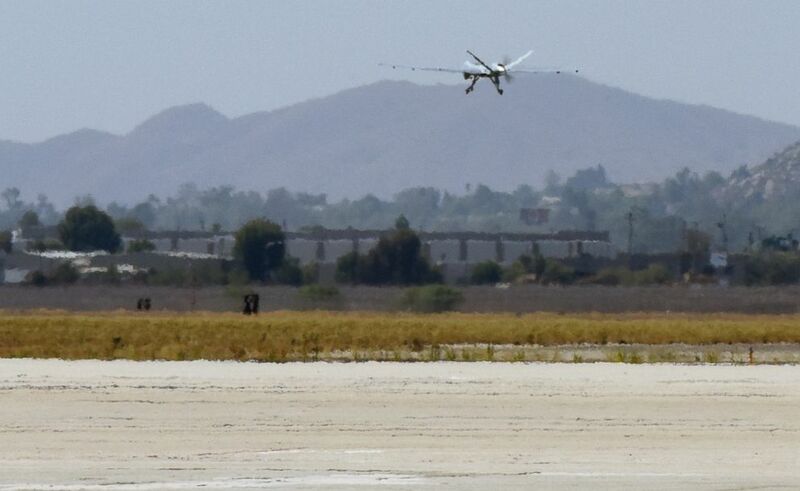 The drone is one of 22 aircraft deployed by the California Guard. As wildfires rage across the state, about 1,000 California National Guard soldiers are supporting response efforts, providing unique military capabilities to contain the fires. (Tech. Sgt.Gregory Solman/California National Guard) An MQ-9 Reaper remotely piloted aircraft takes off from March Air Reserve Base, California, Aug. 1, 2018, to provide visualization and mapping data to firefighters battling deadly fires in Northern California. Massive wildfires, including the Mendocino Complex Fire and Carr Fire, currently cover about 760,000 acres of California -- the size of the state of Rhode Island or 60 times the size of the island of Manhattan, California National Guard officials said on Wednesday. (Senior Airman Crystal Housman/U.S. Air National Guard) U.S.A.F. 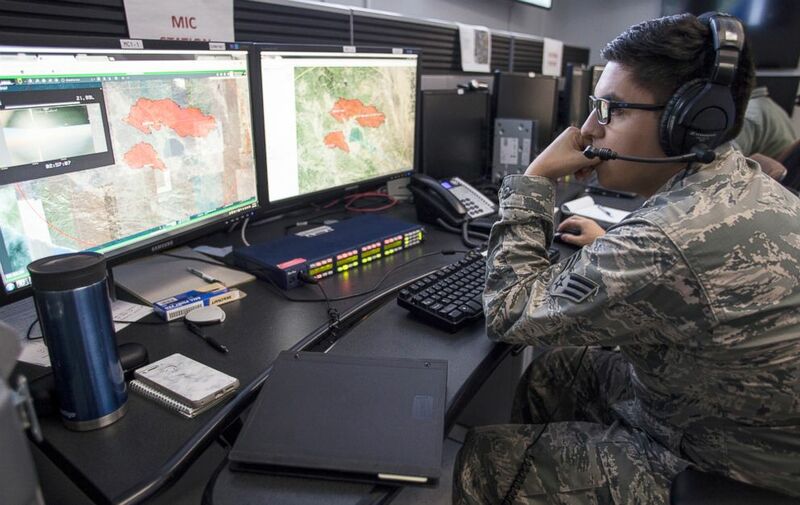 Senior Airman Michael Chacon of the 163d Operations Support Squadron/California Air National Guard, looks at a fire map for the Mendocino Complex Fire, Aug. 4, 2018, while working in an operations center at March Air Reserve Base, Calif.
Guardsmen are using 22 aircraft to help civil authorities fight the fires, including the MQ-9 Reaper, a remotely piloted drone that can fly up to 24 hours each day. The Reaper maps the behavior of a fire in real time, recording thermal imagery that can be analyzed and shared with California Fire chiefs. While it can't fly during certain wind conditions, the Reaper isn't hindered by heavy smoke that can affect piloted aircraft. The drone's infrared capability allows it to "see through" smoke that could otherwise hinder visual sight. (Senior Airman Crystal Housman/U.S. Air National Guard) A modular airborne firefighting system equipped C-130J Hercules aircraft after a stop to reload with fire retardant at the U.S. Forest Service San Bernardino Airtanker Base, in San Bernardino, California, Aug. 8, 2018. While the California National Guard regularly assists in wildfire response, one its top leaders told reporters on Wednesday that the scale of this year's fires is "extraordinary." “These fires are getting bigger. They’re burning more erratically," Maj. Gen. Matthew Beevers, the deputy adjutant general for the California Guard, said at a Pentagon briefing. He credited dry fields from a lack of snowfall as a major contributor to the scale of this year's fires. Beevers estimated that 60 to 70 percent of the state's worst fires are now contained. 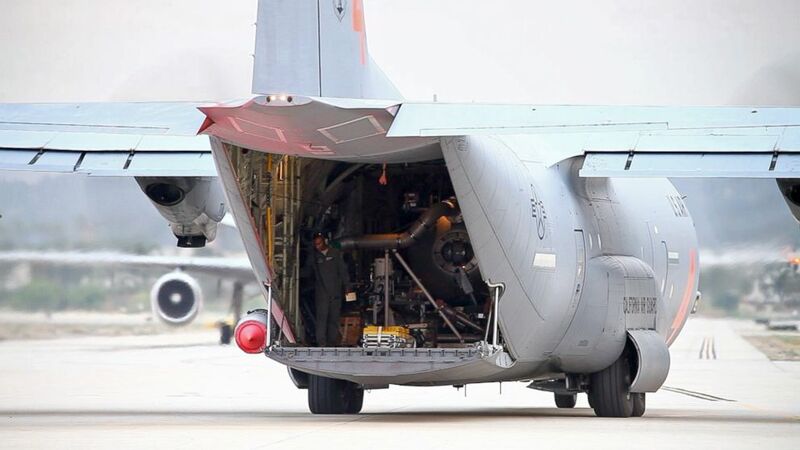 In addition to aviation and airlift capabilities, the National Guard conducts medical evacuations, as well as assists with transportation and security needs. The states of Oregon, Washington, and Colorado have mobilized Guardsmen to support wildfire response operations in their states.